Welcome to Psychic Tarot Readings by Dante! As a professional psychic reader for over 35 years, I find joy in serving people interested in the therapeutic and directional advice that comes from my private Tarot sessions. My goal is to discover the strength and wisdom within to lighten life’s burdens and bring peace, love and happiness to the psyche. My knowledge of astrology, numerology, basic psychology and parapsychology add invaluable insights to my developed, innate abilities. In addition to individual consultations, I am available as an event reader, adding a dazzling element of entertainment to corporate functions or private gatherings. My energetic approach and extraordinary ability to connect with guests is a recipe guaranteed to add a memorable element long after the event has finished. I am certainly blessed to have had many return clients become friends and to have inspired countless others through their journey in life. The invitation to have a Tarot experience with me is always welcome. The recorded origins of the Tarot card deck date back to the early Middle Ages. Some speculate that it had been used for divination purposes for centuries already. But the earliest surviving decks come from Italy and were definitely used during the time of the Renaissance. Following that period interest waned. A strong revival of the deck occurred in the 1910s and again in the 1970s. Since then, Tarot reading has remained a powerful force for healing, meditation and, of course, divination as it has been integrated more and more into mainstream society. The symbolism in the cards can be linked to many esoteric belief systems including the ancient Egyptian religion, the Kabbalah, Christian mysticism, and Hermitic Orders, among others. The 78-card Tarot deck is comprised of two parts: the Major Arcana and the Minor Arcana. The 22 Major Arcana basically tell the story of a soul’s journey through life starting with “The Fool” and ending with “The World.” They symbolize more significant issues and experiences. The remaining 56 cards are organized similarly to regular playing cards using the four suits: cups, pentacles, wands and swords, and range from ace to king. They focus on the life in the everyday. The combination of these two parts creates a powerful link between the microcosm and macrocosm of the human psyche. There are a multitude of decks available, and even kits to make your own, as well as countless books written on the subject. One of the most widely used and celebrated decks is the Rider-Waite-Smith deck, co-created by Arthur Edward Waite and Pamela Colman Smith of the Hermetic Order of the Golden Dawn in 1910. But there are many other popular decks in use today so a reader can find the deck that “speaks’ to him/herself. The invitation is ever present to learn more about how this fascinating, timeless tool can enhance our lives and provide great insight for the inquisitive. I offer a variety of professional Tarot services. The highest ethics are upheld and all readings are conducted with strict confidentiality. Conducted in my studio, private consultations generally last an hour and nothing is required other than an open mind. Sessions are not recorded, but rather note taking is encouraged. If preferred, a client is free to bring a scribe. House calls are not usual in my practice, but under certain circumstances, they can be arranged. Also, I conduct phone sessions for those who cannot come to me in person. Appointments are made on a first come, first served basis. It is best to allow a two-week lead time for greater availability. Often clients inquire about returning for a follow-up session. I loosely set a six-month marker in place to avoid over-exposure and dependency. From the therapeutic style of my readings, most clients feel satisfied to return on a semi-annual, even an annual time frame. In addition, I am available for Tarot parties, which are created on an individual basis with a host. Whether in a home or in a public location, parties can range from formal to causal and are customized to suit the needs of the gathering. Tarot reading for events can be a unique form of entertainment, adding an exciting dimension to any personal or corporate function. Events can range from bridal showers and birthday parties to holiday functions and benefit events. There is a two-hour minimum plus travel reimbursement. Please see some former corporate event clients in the link below. Outside of my private practice, I am flexible to discuss any kind of Tarot reading service to one’s interest, and enjoy making a memorable difference at any venue. "I have been a client of Dante's for almost 12 years now, and in that time I have recommended him to every single important person in my life. All of whom are now repeat clients like me. His ability to interpret tarot cards is more than brilliant, it is a true vocation. From predicting the major moments of my life, to the smallest details of my every-day, Dante is always spot-on. His candor, compassion and humor put you at ease immediately, and make you feel like you are sitting with a close friend. I walk out of every reading feeling better, stronger and lighter than I when I walked in, ready to tackle whatever comes my way, and always excited for my future." "I have recommended many friends and colleagues to Dante. His readings are always clear and resonant. He seems to have an innate sense of capturing the essence of the individual with whom he is engaging. His insights and predictions are often thrillingly accurate. His work is a source of humor, entertainment, comfort and inspiration for those who desire focus and clarity in their lives. Once you experience his magic, you'll enjoy returning time and again. And his readings make wonderful and original gifts for all your friends and loved ones!" "We’re all looking for a way to make our events stand out from the rest. Dante’s tarot readings add an inexplicable air of excitement. 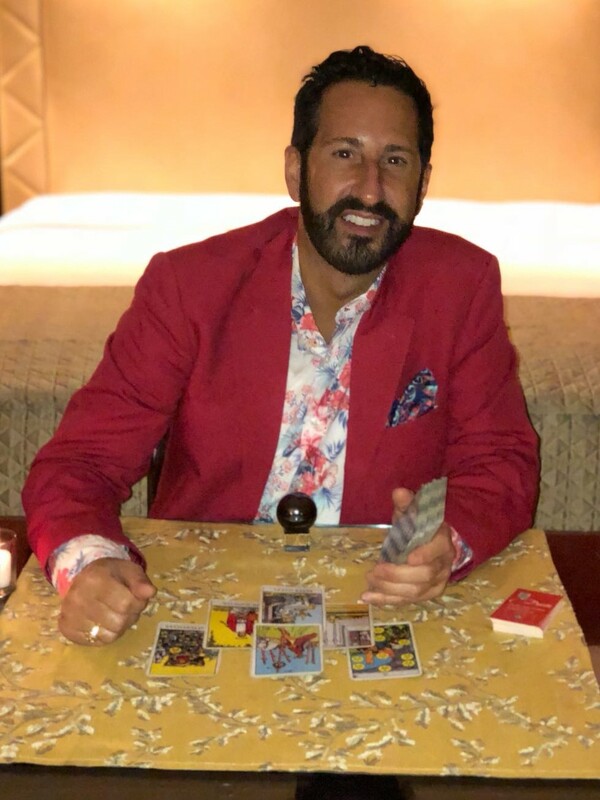 The “psychic suite” creates an on-site buzz and his professional enthusiasm consistently results in accolades at our events." "There are very few authentic psychics today. Believe me I know, I’ve spent my life looking for someone to consult. I have been a professional psychic for over 30 years, and I too need readings because I cannot read for myself. When I found Dante Sabatino, I stopped searching. He is now my reader. I trust him completely. His detailed and accurate predictions, timing, and his pure heart wisdom are like nothing I’ve found anywhere else. I love and need his directness. He does not hold back. When I have to know the truth, when I must make an important decision, or when I need the support and clarity of vision to move on in my life— I consult Dante. 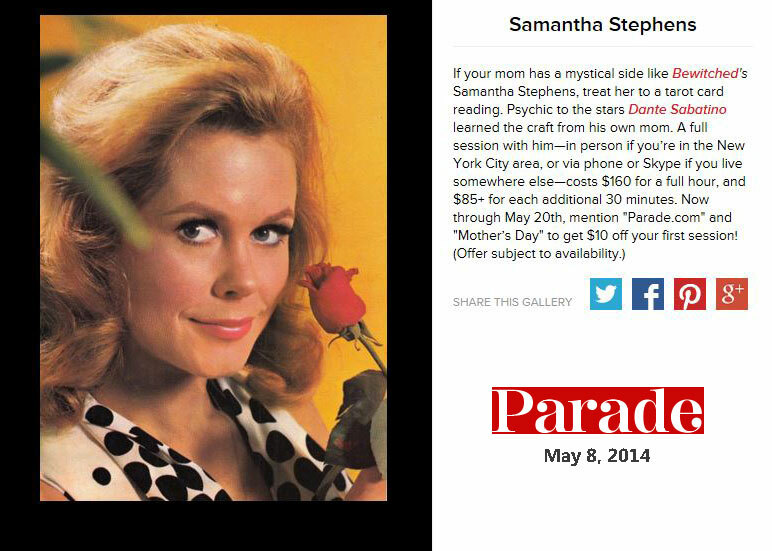 "There are many so called psychics and mediums out there today, but the real ones come along once in a life time. Dante is that comet." "His incredible accuracy is such a small part of the "package." His magic insight, his loving nature and his positive advice helps me to lighten my burdens! I have been seeing him for a few years now and have referred everyone I love to him!" "Dante is like a psychic check-up... If you trust your internist once a year; I trust Dante for my inner soul check-up twice a year. I see Dante as a vital part of my alternative wellness community. His insight, guidance and gifts are amazing and his readings are as important to me as my primary care physician, shiatsu massage therapist and my yoga. He's part of my holistic arsenal." "I've been a client and friend of Dante's for over 20 years. Dante has the gift to empower even the most jaded of souls. His wit and candor help to heal the sometimes painful truth that the tarot cards reveal. Dante's love and compassion always shine through in his in-depth insight that can only come from an innate talent which provocatively blends intuition and magic. After Dante's readings, I have renewed hope and faith and am ready to live life to the fullest." "My first experience with Dante was six years ago. He is amazing and his readings have proven to be uncanny. He is trustworthy and respectful. I keep coming back for more." "Well, Dante, you've done it again! I received two phone calls in the last week from friends who have told me of incidences that recently happened that you predicted. The calls begin with, "You'll never believe what happened." They tell me the story and end with..."Dante said this would happen." "I periodically gather with friends for what we call a "Dante Party." It has become a real ritual for me and my friends that we look forward to. We set aside time to have a tarot card reading and really appreciate the quality time it causes us to spend together. We catch up on each other's lives and have fun sharing our tarot card readings. A reading with Dante is not hocus-pocus. Right from the start you feel like you're visiting with an old friend you have known all your life. Dante is skilled at his craft, educated and sensitive in all ways human. You even get a sense that Dante possesses a special gift of clairvoyance. I think what we love most of all is the dialogue that ensues from asking questions and building a relationship after several readings. The more he gets to know you the deeper the reading. Dante also imparts a level of spirituality and insight in all that is good. You leave feeling refreshed, invigorated and thoughtful. "We move on with our daily lives and find that we refer to our notes in between visits and are surprised at how well Dante hit on the events in our lives. We certainly can't start the New Year without him!" "Dante starts each session by saying that we all have free will. He is a guide. He balances his keen psychic vision with kernels of wisdom that help you understand it all. When I leave a session with Dante I feel prepared for what is to come." 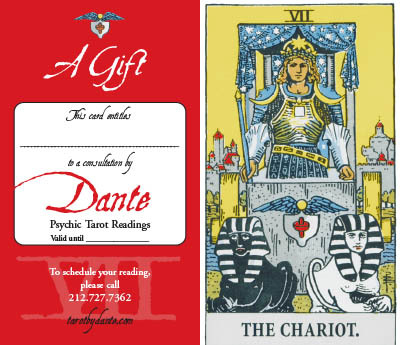 "Dante read tarot cards at our engagement party and it was a FABULOUS and truly unforgettable experience. He came highly recommended from a friend and was enthusiastic and professional from our very first conversation. Our engagement party brought together friends of ours from all walks of life and from all across the country, and Dante helped to bridge conversations between perfect strangers. He was the perfect icebreaker - almost everyone received a reading and no one could stop talking about their experience. On a personal note, Dante is extremely sociable and warm, and was ultimately the perfect addition to our very special night. Since our engagement party, Dante's name keeps coming up amongst our group of friends - so much of what was brought to light in our readings has come true! He truly played an enormous role in making our engagement party a night that far exceeded our expectations and one that will always be remembered!" "I am so enamored of Dante and his talent/ability. He is really phenomenal. His readings are spot-on, and he gives very detailed statements, so you really know what he is referring to. Only hours after my last reading, something he saw and felt in the cards (and then conveyed to me) occurred. And then several days later, another prediction from the reading happened. It was uncanny. The best part of readings with Dante is that it is like visiting with a loving and beautiful friend. He exudes warmth from the moment you see him; actually even before—I love hearing his phone messages; even calling me back to set up the appointment, he is his warm and lovely self. Dante is a light in my life." Dante is pleased to have been featured in the following publications. Click the images below to check out what the press has to say! You can offer a friend or loved one a unique gift for any occasion - a private session with Dante – with an exclusive gift card. Copyright © 2016 Tarot By Dante. For Entertainment Purposes Only.